Yesterday I drew a cover for October. As you all know, October will be coming soon. 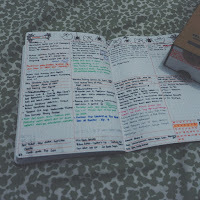 So I must to make a new cover for my journal. I choose Halloween theme for this October. I think almost everybody in West celebrate it and Halloween is in October (you don't say). If you went to a mall for shopping (or just for window shopping), I think you will see Halloween accessories everywhere in the store. Beside that, I also like a spooky things, so I choose Halloween things for October cover. Psst..even tough I like a spooky things, if you ask me to watch a horror movie, the big no is my answer. My favorite quote for that is "You must crush or drive away the satan, not to watch the satan in movie". So, for the Halloween theme, I learn to draw pumpkins and ghost . Really, it is the first time for me to draw that things. First, I search "Halloween doodles" as the keyword in Google. After that I choose the Images tab and pick the picture that I like. I think it is difficult to draw the pumpkin. Yeah, my mind told me like that. But I don't give up and I just try it. With my pencil in my right hand and eraser near my right hand, I try to draw the pumpkin for the first time. Yeah it is really difficult, especially the smile part. I can't make it right. So I always use my eraser to make a better smile for my pumpkin. Finally, I can make it. Yeah! For the ghost, it is easier than the pumpkin. So I just sketch it in flash time. *lebay*. For the finishing, I color it with my Caran d'Ache. I like it very much. Beside that, I like to draw a spider nest. So easy for me . It is just a straight line, straight line, and another straight line. Plus an arc one, another arc, and arc, and arc till it become a spider nest. First time, I use my pencil to draw it. Next, I use my Snowman marker with the black color to replace the pencil sketch. I add a grey color from Stabilo point 88 marker for the finishing touch. Love it! Oh, I also get inspiration from my result of "Halloween font" in Google. 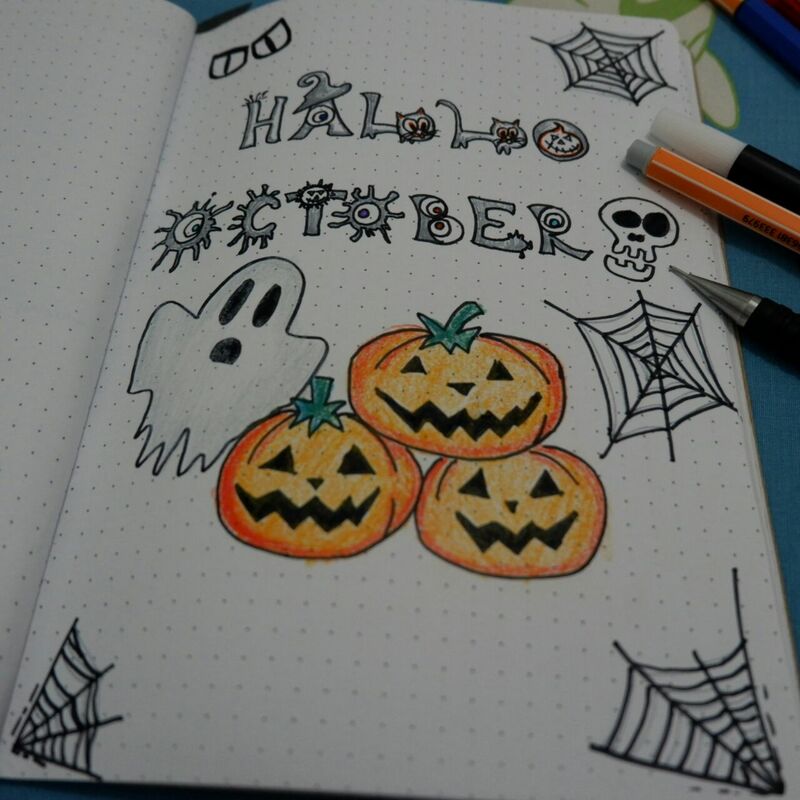 I like that font so I draw it to make a "Hallo October" words. For the first time, it is difficult to make a splash effect. But after I use my Snowman marker, it become easier. I think it is because with Snowman marker, you can get a thicker style. So the splash effect is well perform with Snowman rather than with pencil. I love the "A" font. So creative to make it like a wizard hat with one eye. I also like the "L" font. L which become a cat. So lovely but a bit difficult to make. Thanks Google for the inspiration for my Journal cover. 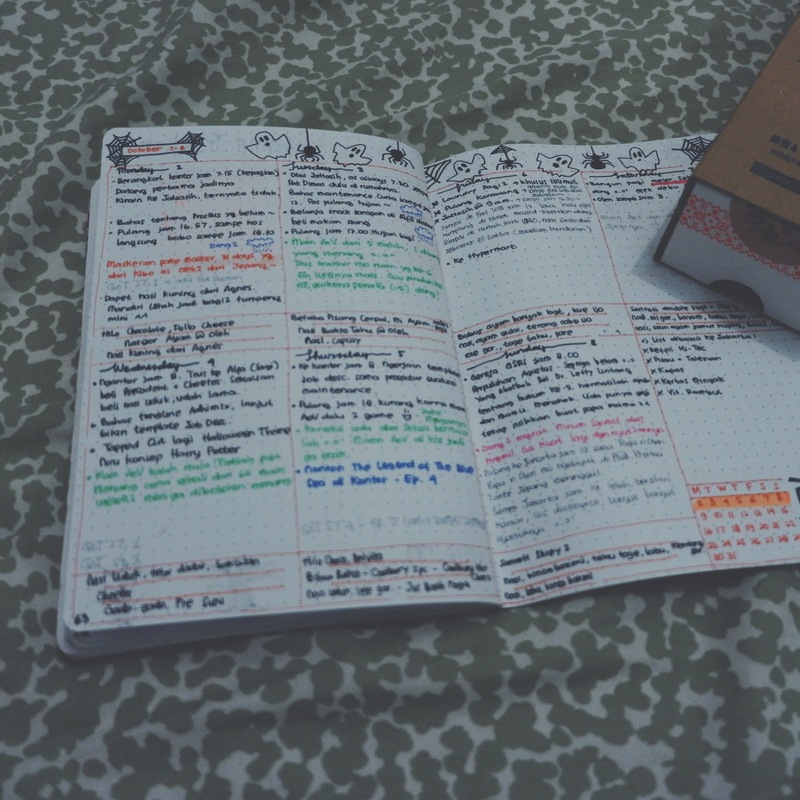 For the monthly log, I still use the same layout in September. I place the date and initial of the day in the middle so they separate the personal lane and work lane. 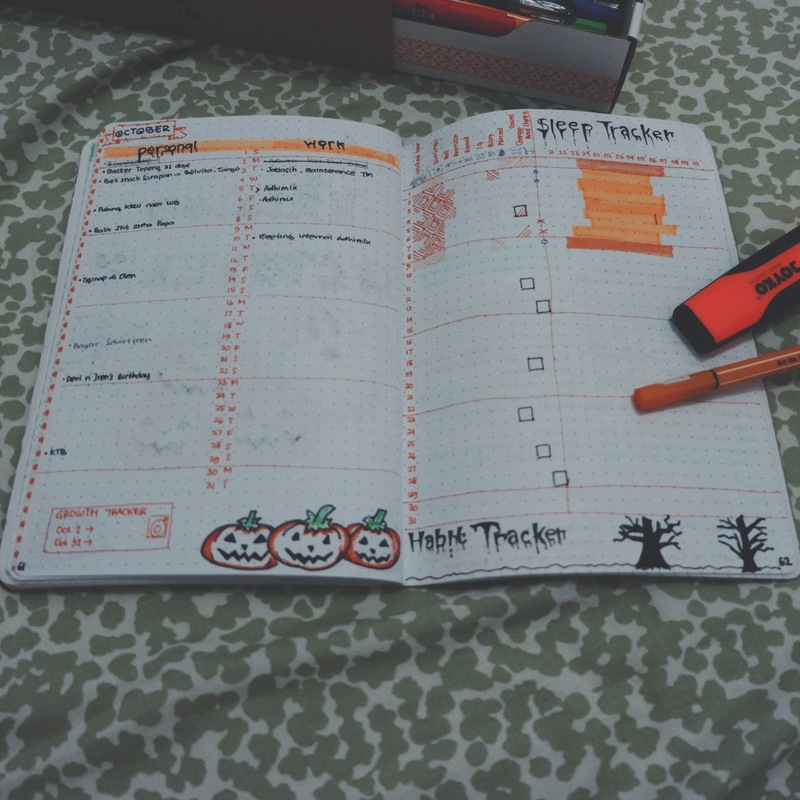 For the next page is my habit tracker and sleep tracker as always. But to be honest, I am not finish it yet. Maybe tomorrow when I have a mood or maybe tonight I will continue my work for my October layout. 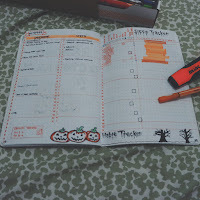 For this month I will use an orange ink because Halloween always use orange and black color. How about you? 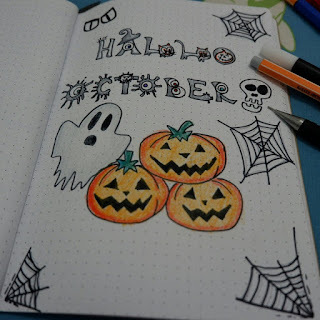 What theme that you use for October?